“Thank you Singapore for the wonderful experience. I was overwhelmed by the warm reception that I had received during the tournament! Many fans approached me for photos and autographs! 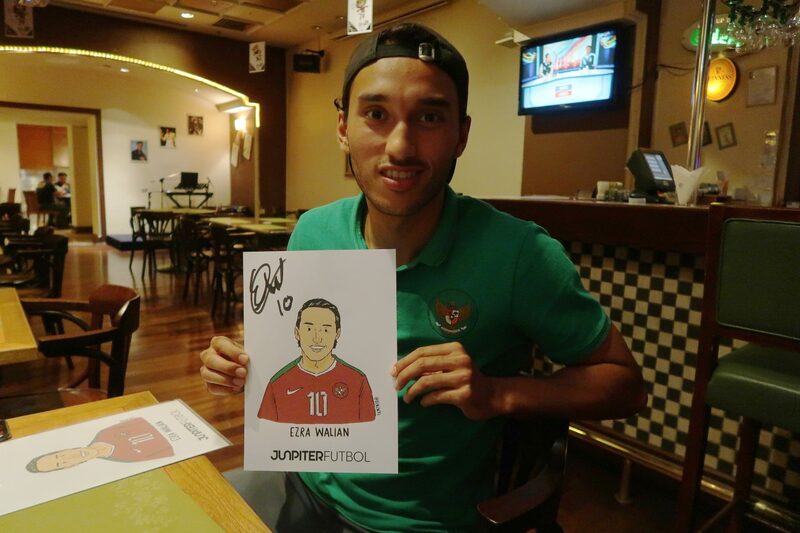 If there is an opportunity, I hope that I can play in Singapore again!” said Ezra Walian during an exclusive interview with Junpiter Futbol in Jakarta back in 2013. A dream of the then 16 years Ajax Amsterdam & Netherlands Youth International is going to come true in the next few days. However, instead of donning the jersey of Netherlands’, this 1.85m tall striker will be donning the football jersey of Indonesia! Ezra Walian, who is turning 21 years old this year, currently plays for Almere City FC in the Jupiler League. Despite having already established himself in the team with 4 goals from 15 outings, the Indonesia U-23 starlet did not think that his called up to represent the country is a walk in the park. “I am extremely happy that coach (Luis Milla) called me up. It has been a long while since I have last represented my country. And to be called up to play for my country, it is always a pleasure and honor,” commented Ezra. So how does it feel to be coming back to Singapore after so many years? “Singapore is a really special country for me because I have too many good memories. I played my first international tournament, Lion City Cup for Ajax Amsterdam in Singapore and from there on, everything in my career just picked up. Even until today, I always think about Singapore and the Lion City Cup with a huge smile. Well, I am all ready to go over to Singapore for the match,” said Ezra. Ezra Walian was handpicked and signed by Ajax Amsterdam from Alkmaar 2 weeks before he traveled with the team to participate in 2012 Lion City Cup. Ajax Amsterdam took home the Championship and Ezra emerged as the Top Scorer in that edition in Singapore. As 15 years old, the striker was already representing Ajax Amsterdam U-19 team. On national level, Ezra was representing Netherlands Youth at all levels until he took up the Indonesian citizenship in 2017. One of his biggest highlights of his career would be the scoring of 5 goals in his debut match for Netherlands U-17 in the UEFA U-17 Championship. Singapore U-23 will host Indonesia U-23 in an international friendly on 21 March 2018 as part of the RISING50 Celebrations to commemorate 50 years of warm bilateral relations (as of 2017) between both nations at the Singapore National Stadium. The kick-off is scheduled for 7.30pm.